On & For Production is conceived as a twofold event: on one hand, it provides a professional context for artists to share film projects in development in order to get conceptual and strategic feedback and to find co-producers. On the other, it is an occasion for organisations, professionals and artists who have a consolidated expertise in artistic film production, to share, discuss and disseminate different modes of working. The Open Workshop examines distribution strategies and how they are usually inserted in –and might affect– the production process, and investigates how to expand such strategies so they better respond to the needs of artists’ films productions. The Open Workshop brings together an international group of leading organisations in the field of artists’ film production, renown professionals and artists working with film. It provides the opportunity to discuss different modes of working, to share common concerns, and to exchange knowledge with other professionals and students working with moving image. The workshop is structured around three case studies that provide practical and concrete examples to gear the discussion between the invited speakers/respondents and the attendants. These case studies have been chosen in order to cover a wide spectrum of issues including the distribution of young artists; the possibilities of hybrid distribution across art and cinema and the complexities that can result from the involvement of multiple partners in one film. Adam Pugh (Artists' Moving Image Project Manager, Independent Cinema Office, GB). Katrien Reist (Coordinator, Jubilee, BE). 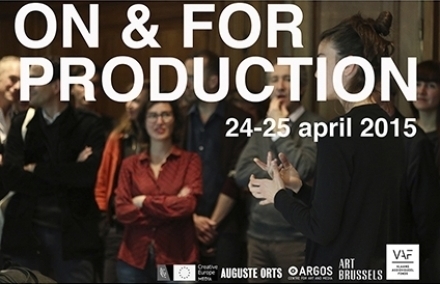 On & For Production was initiated by Auguste Orts (BE) in collaboration with LUX (GB) and Art Brussels (BE). 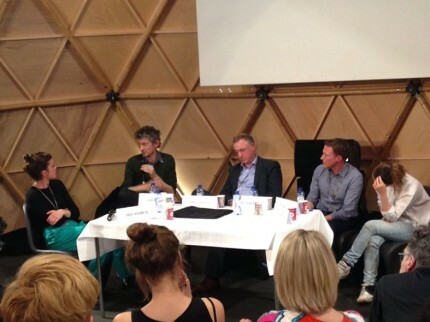 With the support of the Flanders Audiovisual Fund, Argos Center for Art & Media, Creative Europe MEDIA Desk Flanders and Kunstenpunt | Flanders Arts Institute. The Open Workshop is organised in collaboration with RITS School of Arts.